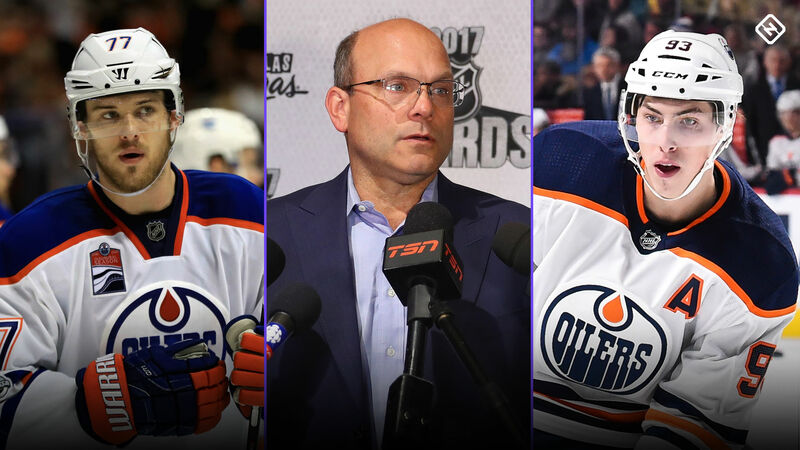 Oilers general manager Peter Chiarelli is the NHL’s most infamous trader. The list of players that have been dealt away during his watch in Boston and Edmonton is an impressive one and includes the likes of Blake Wheeler, Phil Kessel, Tyler Seguin, Taylor Hall and Jordan Eberle. Most general managers go an entire career without having that many All-Star level forwards in their grasp, let alone trading them all away them. In almost all of those cases, the return has been far, far, far less than fair value (Kessel being the exception, as it returned the picks that resulted in Seguin and Dougie Hamilton). In some cases it has been laughably bad. During Chiarelli’s first three years running the Oilers, his tenure has been highlighted by such big, bold moves. 2015 — Chiarelli traded two top-35 draft picks (which turned out to be Mathew Barzal and Anthony Beauvillier) for former top-five selection Griffin Reinhart, then traded three more picks for goalie Cam Talbot. 2016 — Chiarelli traded eventual league MVP Taylor Hall to the Devils for middling defenseman Adam Larsson. 2016 — Chiarelli signed Milan Lucic and Kris Russell to long-term contracts paying a combined $10 million per season. 2017 — Chiarelli traded Jordan Eberle to the Islanders for Ryan Strome. Again, most of those moves did not produce the desired results. Some of them were made in the name of changing what had become a losing culture and breaking up a core that had not won. Some of them were made to trade from a position strength (forwards) to fill a weakness (defense). Whatever the reason, every offseason with Chiarelli at the helm has seen at least one significant, franchise-altering move. And not franchise-altering in a positive way. What has to make it all the more frustrating for Oilers fans is that the team probably would have been better off had the team simply stood pat with the roster it had, especially as it added Connor McDavid and Leon Draisaitl at the top of the 2014 and 2015 drafts. The talent going out compared to the talent coming in did not match, and the $10 million going to Lucic and Russell could have been spent in a better way, especially as the team inches closer and closer to the cap ceiling. Even worse: Hindsight isn’t really a factor in assessing a lot of these situations, since the moves (specifically the Hall and Eberle trades, as well as the Lucic and Russell signings) were almost immediately panned and criticized. Then came this summer in the wake of a bitterly disappointing season that saw the Oilers go from Game 7 of the second round in 2017 to completely missing the playoffs and being one of the worst teams in the league in fewer than 12 months. In the process, they wasted the final year of McDavid’s cheap entry-level deal, probably robbed of him what should have been a second consecutive MVP award, and completely fell back off the NHL map. It would have been easy — and probably expected — for them to do something major in an effort to shake things up or make a change. That is, after all, what the Oilers and Chiarelli do. The No. 10 overall draft pick was floated as trade bait. There was always the possibility that another core player like Ryan Nugent-Hopkins or Oscar Klefbom could have been dealt. Instead, the Oilers did nothing. They stayed at No. 10 and lucked their way into defenseman Evan Bouchard, a selection that currently looks like great value. They resisted the urge to ship out Klefbom at what was probably his lowest possible value. They kept Nugent-Hopkins, who remains an underrated player capable of making a big impact (he had 24 goals and 24 assists in only 68 games this past season). Their additions in free agency were mostly bargain-basement signings that didn’t break the bank or their salary cap number. All of this is … totally reasonable. Seriously. It is. Doing nothing was probably the best bet here. First, there is the possibility that the 2017-18 Oilers were better than their final spot in the standings. I know, you are what your record says you are, but sometimes crazy things happen in hockey and it can be one of the least predictable sports out there. Even after trading Hall and Eberle in back-to-back offseasons, they still have a trio of stars in McDavid, Draisaitl and Nugent-Hopkins who can still be the foundation of a contending team. Even though those three cost a lot of money, they are just entering their prime years right now and the Oilers are still getting value for that financial commitment. Those three can carry an offense a long way. Edmonton was also a decent five-on-five team for much of the season, only to be devastated by disastrous special teams and a goalie situation that resulted in Talbot getting run into the ground (for the second year in a row) as they had no reliable backup to give him a rest. The power play struggles were alarming given that it is a team that has McDavid, Draisaitl and Nugent-Hopkins as forward options, and it is still unknown as to whether or not those areas can be easily fixed. That’s especially true in the goaltending department, where Talbot will still be relied on to carry the load ahead of new backup Mikko Koskinen, a 30-year-old netminder who has all of four games of NHL experience … all coming during the 2010-11 season. Koskinen has spent the past six seasons playing overseas, including the last five in the KHL. To say he is a mystery is an understatement. There is also reason to believe that Klefbom can bounce back from an injury-plagued season that saw his play badly regress. That is why the thought of trading him seemed like such a horrendous idea. Had it happened, it would have been easy to see that being the next move to come back and bite the Oilers. A Klefbom trade this summer would have been dealing him at his lowest possible value and jettisoning the best, most talented blue-liner on the team. During the 2016-17 season Klefbom was tremendous on the Edmonton defense and there is every reason to believe he can get back to that level. Before the 2017-18 season, the Oilers were pegged by many (including the oddsmakers in Vegas) to be a potential Stanley Cup winning team. That hype was premature, because even with arguably the best player in the world and a couple of other high-level forwards, the Oilers were, and still are, a very flawed team. They lack depth beyond the top forwards, the defense is not great, goaltending is a question. They were maybe not quite as good as their 2016-17 playoff run indicated. At the same time, they are probably not quite as bad as the disastrous 2017-18 season would have you believe, either, because pretty much everything went wrong at the same time. That is why the best move to make this offseason was to make no move at all. At least no move of significance. Chances are, moving one of Klefbom or Nugent-Hopkins would have backfired horribly and put the team in an even deeper hole, just as almost every other major trade Chiarelli has made in recent years. It is a lot easier to think the Oilers’ power play and penalty kill can rebound and that Talbot might play a little better than it is to believe a major trade involving a top pick or a core player would have improved them in a meaningful way. You don’t win by trading away high-level players, something the Oilers have done far too many times in recent years. This is still a flawed team that is not really ready to be a Stanley Cup contender this season, which is an indictment of the job the current front office has done, three years into the careers of McDavid and Draisaitl and still no closer to winning. Perhaps it is reaching an extremely low bar, but they probably did manage to get themselves closer by not doing something irreversibly dumb, just as it has so many times over the past three years. Maybe, finally, after losing so many blockbuster trades, the Oilers finally learned their lesson.